Edison Research will present a new research study, "Understanding Parents, Teens, and Country Music" on Thursday, February 14. 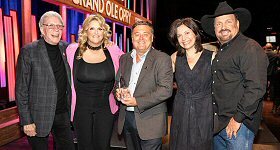 This special presentation, commissioned by Country Radio Seminar (CRS) for their 50th anniversary, looks at both the present and the future of country, radio and how music gets passed down... and up. The study is based on both a national survey of parents and teens, and also video ethnography of how these two groups interact with music, the radio and each other. Nearly half of teenagers say that music is a "bonding activity" with their parents. 60% of teens who listen to Country Music say their parents have gotten them to listen more to Country Music. According to Edison's industry-leading Share of Ear study, AM/FM radio remains the top platform for teens, with 63% of 13-19 year-olds listening to radio every day. Attendees will learn about important new findings about how teens and their parents interact with Country, along with insights and recommendations from Edison's Larry Rosin, Megan Lazovick and Laura Ivey. This session will be held at 3:30 Central time on Thursday, February 14th, in Legends D-G at the Nashville Omni Hotel.